I have always loved watching throwers in competition. The strength behind the shot puts, the precision of the spin, and that moment of anticipation while watching the implement fly through the air are so athletic, yet poetic to me. Some throwers may have a little bit more of an inherent ability, but all successful throwers spend many hours practicing. Maybe this is why the throws are so satisfying to watch: the culmination of many hours of work is evident in the briefest of moments before the implement lands. Ed Cosner preparing for a stone put. The San Antonio Highland Games and Celtic Music Festival: Paint the Town Plaid! The Games are obviously my favorite part. Men and women compete over 2 days in the caber toss, sheaf toss, hammer throwing, stone put, and weight over bar and weight for distance. These aren't just weekend warriors, either; world records have been set at these games. Ed and his wife, Sally. "Sally, the key to holding the weekend together." Kathryn: How did you begin working with the Highland Games? Ed: I started competing in 1995 and have traveled the world competing. I was never a pure thrower and was still competing in powerlifting and strongman until 2000 when I went full time as a Highland Games Athlete. I really began to win championships when I became a Master’s Competitor (40 years old). Kathryn: So at that point you were a successful multi-sport athlete (Highland Games, powerlifting, and strongman). 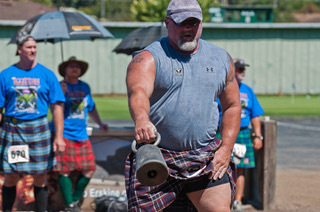 How did you transition from athlete into Athletic Director for the San Antonio Highland Games? Ed: I went to a meeting for the San Antonio Highland Games and the rest is history!!!! I was asked to take over the games in 2004, when there weren’t too many athletes competing. I was a champion and respected among my peers, so the men and women I competed with stepped up and came to my games. I brought out my coach and training partner, James Parman, to judge and announce the games. People got excited to see real athletes out there, and to know what’s going on out on the field as well. James is awesome at that. 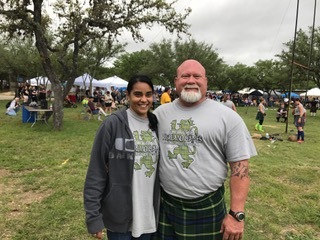 His being a World Champion Professional Highland Games athlete himself and knowing all of the traditions and history behind the events makes it a fun experience. Sidenote from Kathryn: I can attest, James is very informative, and humorous! The games are fun to watch even for someone who knows nothing about the games, since James does such a great job entertaining and informing the crowd. Kathryn: What is your favorite event? Ed: I love the heavy implements especially the caber and heavy weight for distance and height. Kathryn: What else do you love about the games? Ed: I love training for the games as it requires a beautiful blend of maximal strength to maintain positions while spinning/moving with heavy implements (like the 56# weight for distance, 56# weight for height, 23# Braemar Stone put or a heavy caber), explosive strength to throw these implements big distances to win, and the explosive power to throw the lighter implements (like the 16# open stone, 28# weight for distance), run and turn with a long caber, or the flexibility to wind a Scottish Hammer. Ed prepares for the weight over the bar event. "Big, Strong & Powerful is what a Scottish Heavy Athlete is." Come on out to the games! It truly is a lot of fun regardless of your age or ability level. Check out the crowd getting involved in a caber toss in this video.